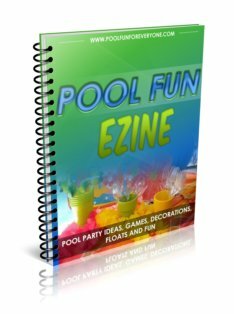 A spring pool float is becoming the more popular choice for swimming pool lounge floats. They require just a few puffs of air to inflate the head portion and then can easily be deflated and stored in your pool storage area or the trunk of your car if you are going to the beach. This is the first one we purchased and still use it after several years. 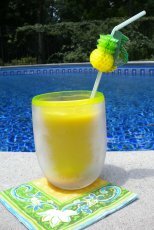 With a mesh bottom, you are kept cool by the pool water instead of floating on a hot piece of plastic. The head rest is inflated as is the rim all around the float. If you like to lay flat with a comfortable head rest this float works great. 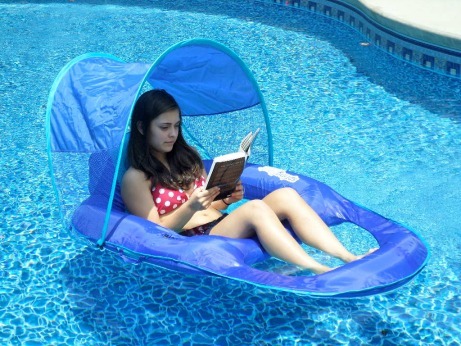 Looking for a pool lounge float that provides some shade? 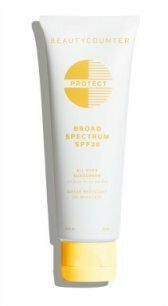 Protect your face from the harsh effects of ultra violet light with a canopy that can stay on or come off. This swimming pool float has become the latest favorite of our pool floaters. What does everyone like? If you are going on a vacation you can easily pack this spring pool float in your suitcase. You can find them in the summer at big stores, but otherwise you need to find them on-line. This on line pool store has the best price I've ever seen. This almost unsinkable chair float is easy to set up. Just a few blows and the inflatable edge has you floating in the pool in minutes. I find the mesh bottom more comfortable than sticky plastic. This swimming pool float has you sitting deeper in the water - which for those of us who live in a hot climate, it's a great way to keep cool. Reclining spring pool floats are a great way to stay cool and relaxed in the pool. These floats are often preferred over plastic, inflatable floats because they are easier to set up (no need to blow and blow) and easier to store. They instantly spring open and close. A Jet Valve™ is used to inflate and deflates the headrest and sides easily. The mesh fabric provides a comfortable cradling feel and keeps you wet and cool. Each year it seems that a new style becomes available, like this lounge float that reclines. 4. Canopy provides great protection from the sun. The canopy can be adjusted as the sun moves. Of course you must always stand right next to the float watching and holding it as the child may try to get out or tip it.